The award-winning iQunet Vibration Sensor is used to monitor machine conditions such as vibrations and temperature. The wireless, battery-operated instrument includes a sensor, data collector, and radio in one compact device. The sensor collects triple-axis vibration acceleration data which can be analyzed to provide further insights into the condition of the machine. 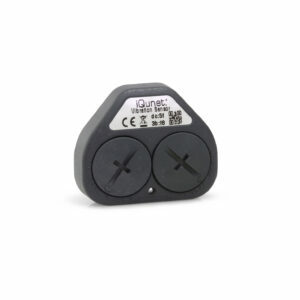 The iQunet Proximity Sensor monitors the linear distance between machine components. By measuring the magnetic field, this accurate and easily programmable hall-effect sensor is able to detect the proximity of a magnet down to the range of a few nanometers. This enables accurate monitoring of parameters such as the alignment and tension of conveyor belts over long periods of time. This magnetically actuated internal reed switch monitors the presence of machine components wirelessly. An open switch is closed in the presence of a magnet. The Proximity Switch Sensor can collect data such as machine cycles, the rotation speed of machinery, or the position of doors (open or closed). The iQunet wireless Temperature Logger Sensor is “armed” via the sensor dashboard. Based on an adjustable vibration level, the temperature logging starts even outside the wireless sensor network. Once back in the sensor network, the sensor releases its data. Like with all iQunet sensors, data is saved on the iQunet server and can be visualized in the sensor dashboard or accessed via OPC UA communication. This wireless VOC/CO2 Sensor can measure levels of volatile organic compounds (VOCs), carbon dioxide (CO2), relative humidity, and temperature in the air surrounding it. This is useful for measuring the air quality in workplaces and ensuring the space meets local regulations. The sensor is both wireless and battery-operated.